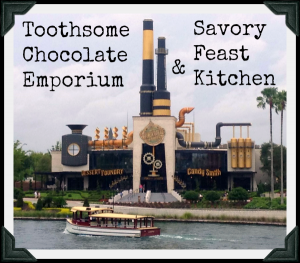 From the moment I set eyes on the new Toothsome Chocolate Emporium & Savory Feast Kitchen, I knew I had to eat there. We stepped into Universal’s City Walk area, and there was this giant whimsical factory-like building sitting there across the waterway, just begging to be explored. That first afternoon I convinced my family to walk over the bridge and take a look at the place. I was hoping to make reservations for the following evening, but it turned out they weren’t accepting reservations yet (the restaurant was still in preview mode as this was prior to their grand opening event which happened on Sept. 22nd). 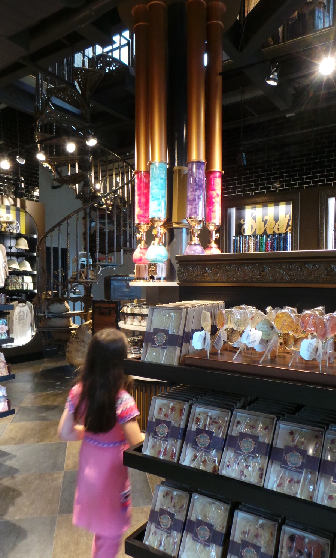 Still, we set foot inside to explore, and that is when we fell in love with the Toothsome Chocolate Emporium gift shop. 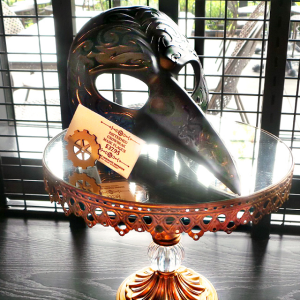 It was a delightful space full of neat steampunk themed knicknacks, some for sale, some just for looks. Everything about the place had a very whimsical feel to it. 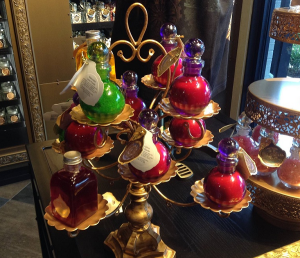 There were stacks of wee glass potion bottles, filled with flavoured sugars and salts. The back area of the shop was dominated by a machine that dispensed multiple flavours of cotton candy. There were stacks of chocolate bark, and boxes of fresh marshmallows. 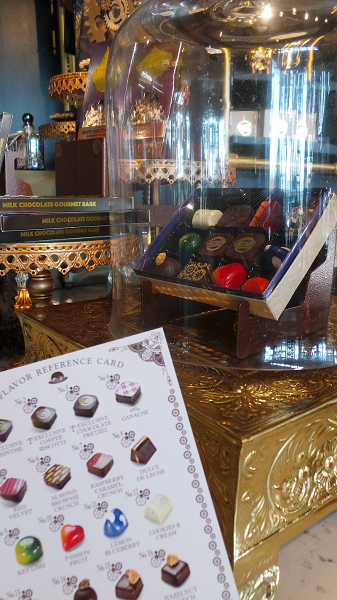 There were glass cases full of a wide variety of chocolates, truffles, bars, brittles and macarons. The store shelves were stocked with not just the usual gift shop t-shirts and the like, but also nifty Victorian styled hats, both his and hers. There was a spot in the back where you could dip into the giant containers and fill your own jar with whatever candies caught your fancy. 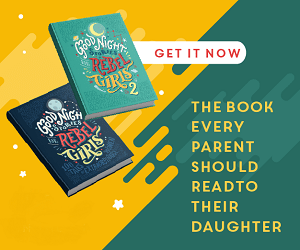 That first afternoon we just browsed. though I did go back later in our trip and pick up a neat porcelain mask to take home with us (as well as a few scrumptious chocolates, which quickly disappeared). Overall I thought the gift shop at the Toothsome Chocolate Emporium was a wonderful, whimsical, space, full of eye catching trinkets and yummy handmade sweets. Even if you don’t find you have the time to dine in the Savory Feast Kitchen (and you really should! ), if you are heading to Universal Orlando City Walk I would definitely rate this small store front as not to be missed. Check out my full dining review here, if you’re curious to know what it’s like to eat at Toothsome’s Savoury Feast Kitchen.